Liverpool's hopes of qualifying for the Champions League took another huge blow as they failed to break down resolute Fulham despite dominating possession. 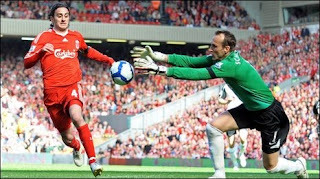 Alberto Aquilani's early overhead kick was easily collected by Mark Schwarzer. And the Australian continued to thwart Liverpool and Aquilani, saving his 20-yard curling effort and watching the Italian's left-footed drive fly wide. Schwarzer was again equal to Ryan Babel's fierce strike as Fulham defended deep and frustrated Liverpool. This game could have been a dress rehearsal for the Europa League final in Hamburg - if Liverpool and Fulham are able to overcome their respective semi-final opponents. But if that is the case, the neutral will hope for a far less one-sided affair - as Liverpool attacked relentlessly but lacked the necessary guile to open the scoring. Rafael Benitez's Liverpool side will take on Atletico Madrid after overcoming Benfica 4-1 at Anfield to win 5-3 on aggregate, while Fulham won 1-0 at German champions Wolfsburg for a 3-1 aggregate victory and will face Hamburg in their last-four encounter. But, there were no signs that Liverpool were feeling the effects of their exertions in the week as they started brightly with chances falling to David Ngog, Maxi Rodriguez and Aquilani. The home side had received an attacking blow prior to kick-off when talismanic 22-goal striker Fernando Torres was ruled out with a knee injury. "I am a little bit disappointed, normally when you control the game and have chances you can score. We know the fourth position is a little bit far away. "They were deep, they were well organised and we had to score. We had one or two chances, their keeper was good, but it's not easy to find space when they have players behind the ball. "We needed to be patient and it was not easy to find the final pass in the final third. "I am disappointed because I feel that we had plenty of possession." "There is no doubt Liverpool dominated the game and we were forced on to the back foot but at the same time we stood our corner very well and fought very hard. "We stopped them getting clear-cut chances and it was really when we just lost Daniel Agger for a corner at the end that I was concerned the ball was going to go in the back of the net. "On the occasions when they got good strikes in Mark Schwarzer was equal to it. It is another excellent clean sheet. "I have got to be very satisfied with what the team has done because Liverpool are a very difficult team to take points off home or away."